a jewish journey. all shook up. In this week’s Torah portion, Korah, we re-face a serious act of rebellion, an uprising against the priestly status of the Levites and against Moses. Though the story of Korah and his followers isn’t just a story about revolt, but dives into defiance as a larger concept — how the need to control, something so simple, can create such harm. The rebellion and its conclusion, with God opening up the Earth, Korah descending, alive, into the ground, while Aaron’s staff blossoms with ripe almonds, raises more questions about the self than it does about the community. Usually I come away from these forays into the Jewish narrative contemplating community, but now, actually, I’m led to medidate on what it means to understand and control oneself. It’s a difficult balance, but clearly so important. With Korah and his 250 followers, the justification for their rebellion is false contempt and blame — as when Korah says, “”Is it not enough that you have brought us out of a land flowing with milk and honey to kill us in the desert, that you should also exercise authority over us?” But for Aaron, Moses, and the Levites, there is rav chessed (abundant love) – imploring to slow down, to look for wisdom outside of one’s immediate emotions. 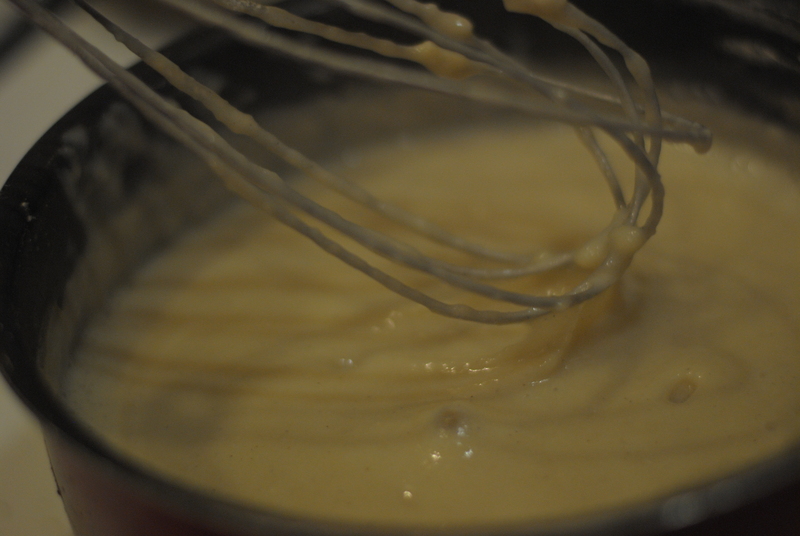 It was with this in mind that I stirred my way through this recipe, thinking of the desire to obtain and control. This recipe requires nearly 45 minutes of constant stirring. There is nothing you can do but slow down and watch the whisk going around and around. In other words, your actions calm you, change your emotions and your feelings. 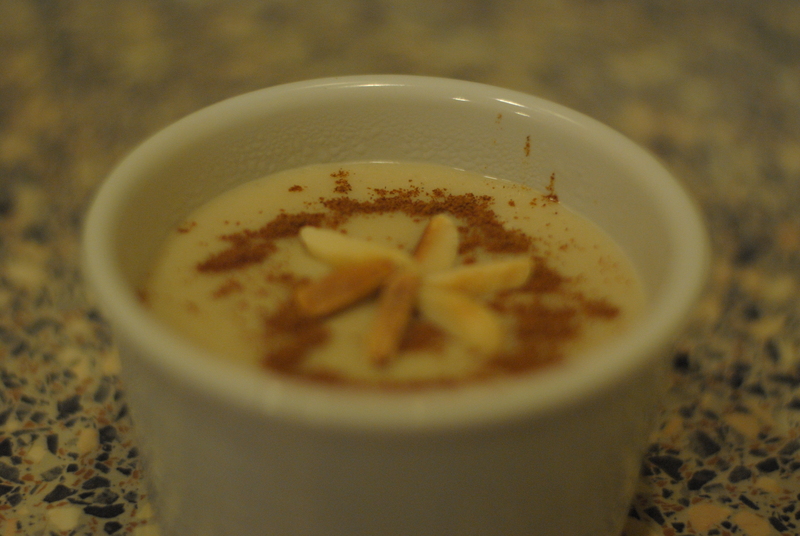 I was almost beside myself in finding and creating almond phirni. 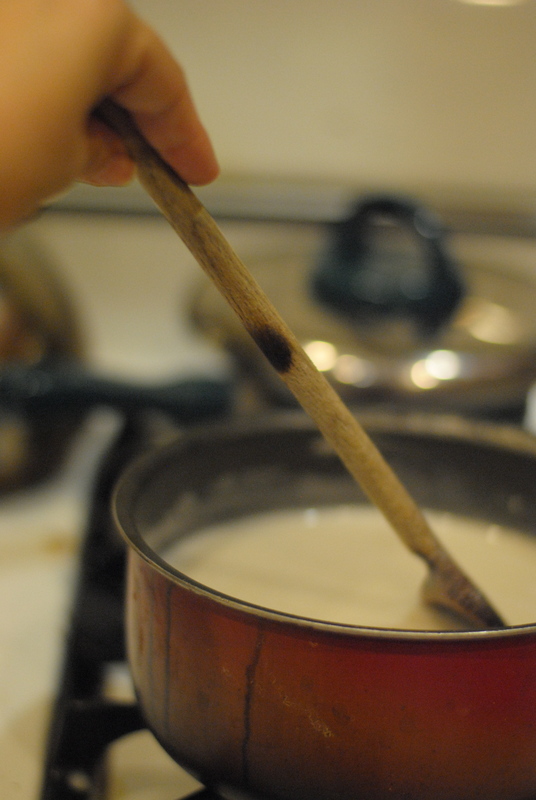 I started out using a wooden spoon, but quickly realized that a whisk is better! 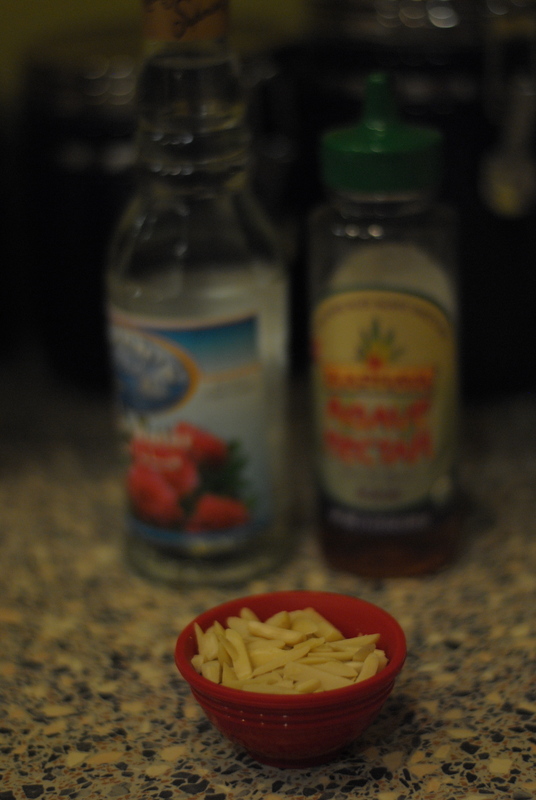 Add the agave syrup, the sugar, rosewater, and cardamom. 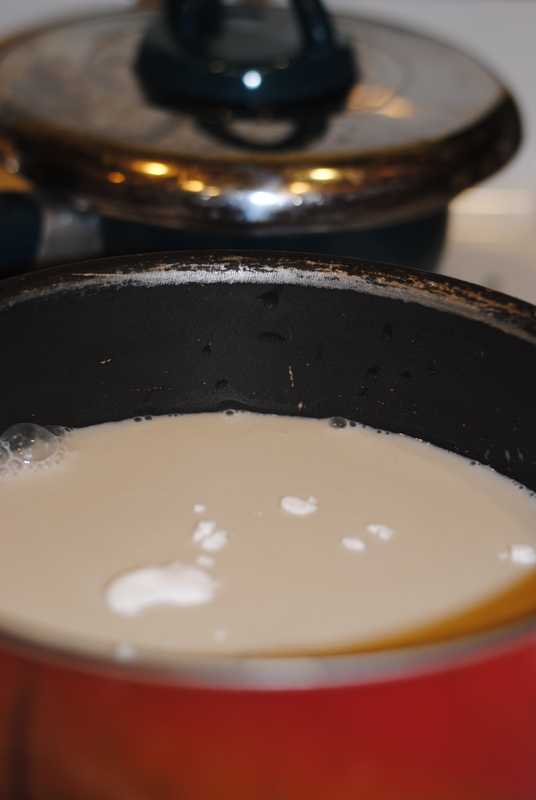 Stir over medium heat until fereni thickens (about 30-45 minutes). At 10, then 20, then 25 minutes, I realized that I had the proportions wrong. Almond milk, though the creamiest of non-dairy milks, needs a significantly higher ratio of flour to milk (accurate amount is reflected above, don’t worry!). 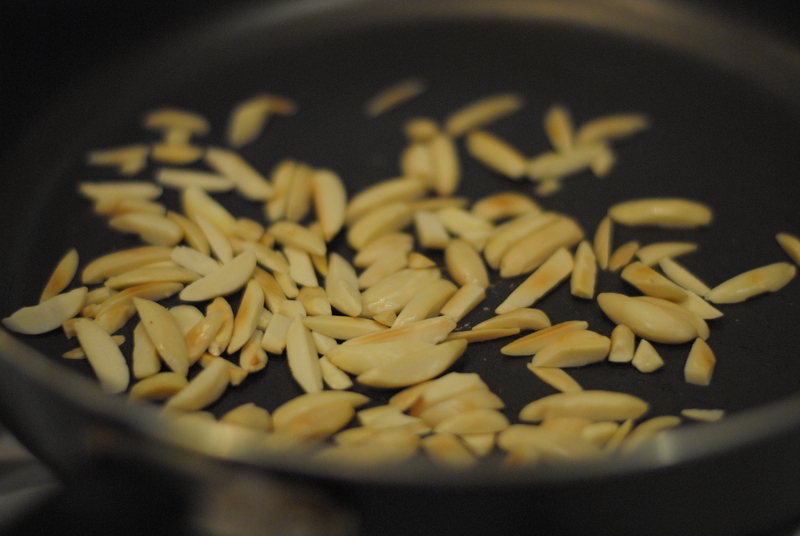 Use your free hand to roast the slivered almonds. Medium to low heat is good. Toss the almonds around. When you start to smell the oil, they should be done (about 5-10 minutes). With your other hand, you should still be stirring the pudding. Once the pudding has become obviously thick, let it cool for 5 minutes. I chose to garnish with an almond Star of David and a swirl of cinnamon. Serve cold or hot in individual dishes. 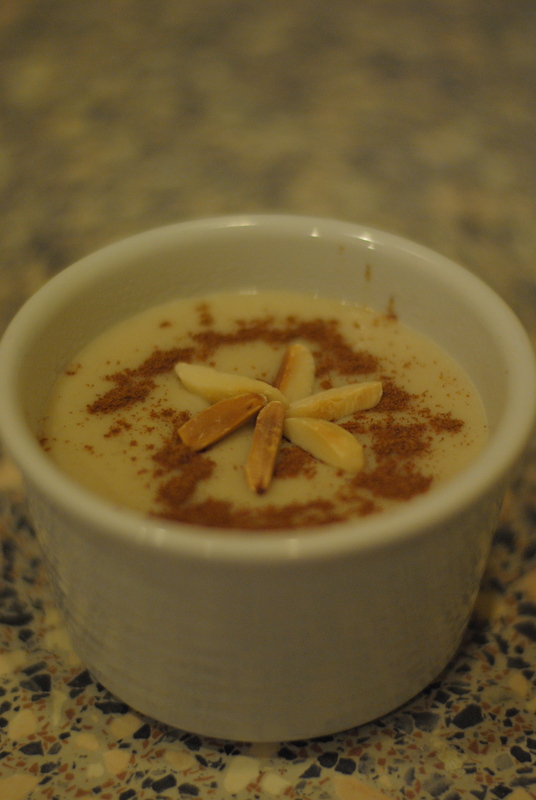 Through my research, I found that phirni is known as fereni in Iran, ferni in Pakistan, and phirni in India. Largely the same base in all these countries, the dessert is a sweet milk-based pudding that is prominent and popular in North Indian cuisine. It is popular, too, by its different names in Iran and Pakistan, and elsewhere! Garnishes range from dried fruits, to cinnamon, to, most popular, pistachios. You can cook the pudding itself with or without cardamom and rose water. Nothing in there screams Jewish in any conventional sense. So, what makes this dessert Jewish? This is the question that arises, again and again, as I pull exotic favorites out. It’s one that I think I answer each time I go to make something, but I’m personally never truly satisfied with my own ideas, but perhaps that’s precisely the point. Jewish history has, in many ways, taken us all around the world. The Jewish experience, outside of America especially, is one that is invaluably wide. It’s an experience we are still tapping into, through trips, through our foods, learning. The answers aren’t satisfactory because we still ahve so much to taste and to know. Many of the Jews from these other countries where phirini is common dessert became couriers of the Mughal emperors of Agra and Delhi following the Muslim conquest of North India (so I read on the semi-reliable interwebs). They became court advisors, poets, physicians. These are the Jews who came from Portugal by way of Italy, Turkey, and Syria. The Sephardim settled and flourished in India. They did not just live — they found refuse, freedom, and prosperity in India. I like to fantasize myself a poet in those times. Imagining myself with a cup of this in my hand, sitting in the sun. Paper and pen in the other. In its own way also meditative, it seems that with the Torah, my kitchen cupboard, and these words, I can get quite close. In my searching for drashes on Korah, I came across the idea of deriving more through the Hebrew meaning of names. Korah is ‘son who brought upon himself anger hot as the noon sun.” While Korah, consumed by this anger, accosted Moses and Aaron, Moses, instructed by God, placed the staffs from each of the 12 hourses outside the Tent of Testimony to see which would blossom by the hand of God. Aaron’s staff not only blossomed with flowers and buds, but also with ripe almonds. It was then that the Lord instructed Moses to put Aaron’s staff in front of the Testimony as a keepsake and a sign. What has “won” here is loving kindness in the face of control and blame, two far easier emotions — they don’t require constant stirring, practice, medidation. I consider my cooking to be a personal routine warming me up for Jewish practice. I get a taste of dhikr, of concentration, and visualization in the kitchen space. Swirling this pudding, feeling it thicken with my hands made me think about growing and expanding in myself — the repetition it takes, and the sheer, monotonous time. When we don’t take the time to work at the love inside of us alone, we can become constricted, like little lumps, in ourselves, unable to let anything flow or develop. We run the risk of becoming solely focused on our own beliefs about what is good and what is not good — we judge ourselves above others, losing sight of the potential growth in cooperation. It can be hard, especially the first time, to dedicate 45 minutes to stirring liquid to make pudding — I was a little fearful that it would not thicken. I wanted to turn up the heat, add more rice flour. My impatience, even here, almost compelled me to ruin the recipe entirely. We do this a lot, I think, and it’s nice to be reminded that each task we take on, however mundane, can be powerful — use the time to breathe, to not impose yourself on your creations or on others. This looks lovely! Thanks for sharing!